A gorgeous idea featuring tall glass wedding table centerpieces in a reception room bathed in shades of purple. These really unique centerpiece glasses rise up from the center of the reception tables. They are shaped to look like super-tall wine glasses, but the effect is not in any way gimmicky, rather, its really very elegant and visually striking. Floral cluster arrangements featuring star gazer lilies are placed inside the centerpiece glasses, nestled into a bed of moistened Spanish Moss to keep the flowers fresh. 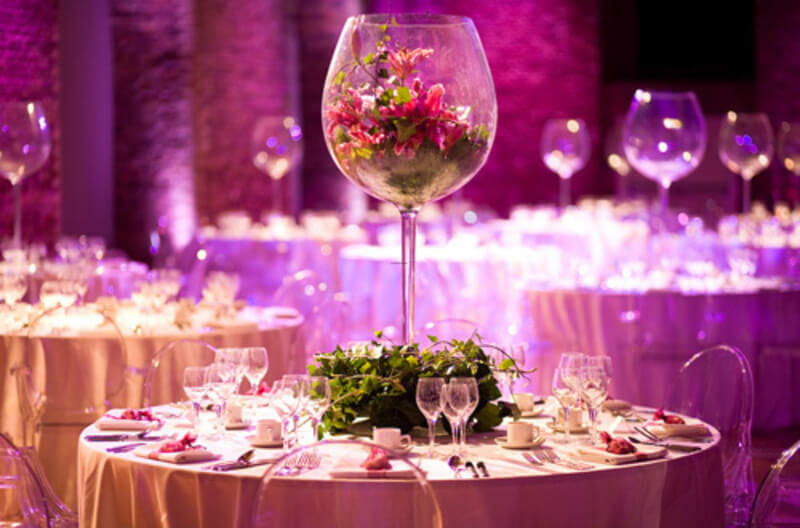 The base of each glass is positioned on the center of the table, and covered in a mound of green ivy, giving these centerpieces a multi-level dimension which makes them extra-interesting. The table covers are pale pink, however, through professional lighting with the use of a colored lens, the table covers and the entire reception room, are bathed in a beautiful purple glow. The clear acrylic chairs are super-cool too. The result is absolutely stunning wedding decor. Who Sits at the Head Table at the Wedding Reception? Table Numbers Dessert Table Design a Vintage Sweetheart Table & Backdrop. Go Shabby-Chic!